Beyond the Velvet: The Christmas Tag! 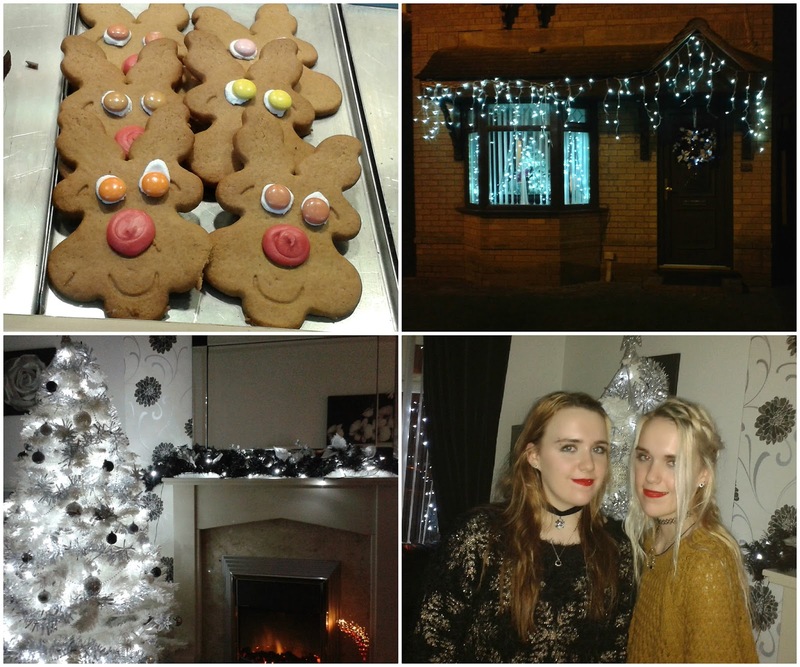 This is my first Christmas in the blogging world and I'd thought I'd join in with the Christmas tag! Also, thank you to Carolyn (x) for tagging us! I usually watch the Christmas movies that are on t.v but I love watching Home Alone. I also love watching Bridget Jones and Harry Potter at this time of year. Always Christmas morning. I always get up really, really early just to open my presents as I'm just so excited! I still feel like a little kid on Christmas morning! There are so many! I think every Christmas new memories are made. Nothing beats Christmas when your little though. I think my favourite memories are from when I was young and when I still believed in Santa. Oh, and Christmas mornings were always the best too! Roast dinner! I love them sooo much. Mince pies, chocolate selction boxes, the chocolate tins and just eating until I feel sick! Haha. I never liked Christmas pudding though. I wish I did but I just never have! I love getting new clothes to wear on Christmas day and I always love getting little bits of expensive make up at Christmas too. I really like it when my Mum and Dad surprise me with something I had no idea about too! Well, ever since I got Versace perfumes for Christmas two years ago they have always reminded me of Christmas. I'm actually getting Crystal Noir by Versace this year.They all smell so rich and stay on all day too. Putting on a new pair of cosy pyjamas and slippers at night and just waiting for Christmas morning while watching all the festive programmes on T.V! It used to be an Angel but now it's a sparkly silver star. I absolutely love it when I first wake up and think ''oh my God! It's Christmas!'' but I love spending the day with my family and having a nice realxing time. I do also like going on a nice festive walk, all cosy in my hat and scarf and seeing all the Christmas lights at night. I don't know about you but I'm feeling super festive right now! I can't wait for Christmas to come. I wish it would come quicker! I tag anyone who would like to do these questions so if you would like to do this tag, please do! I'd love to see all your answers. Christmas is better when you're younger! More exciting for sure. Although you do start to appreciate it for different reasons when you get older, such as getting to see family you don't always see during the rest of the year! I love this tag, the colour scheme of your decorations is gorgeous! Lovely tag and great answers!! I love watching Harry Potter and Bridget Jones at this time of year as well! Fantastic answers! I also love watching Bridget Jones at this time of year :) love the pictures too! Home Alone is one of my favorite Christmas movies too! This was such a lovely post, and your decorations look so nice! This is such a great tag, I'll definitely have to do it! Home Alone is such a good movie! This was a great read, I also wanted baby wee wee when younger, hahaha! This tag made me soo much more excited for Christmas than I already was! Love reading your answers, thank you for sharing! My favourite part of Christmas is gift shopping! Yes, any reasons to shop, eh? LOL! I get up far too early too, I'm always up before my little brother! Christmas eve is one of my favourite bits about Christmas! Christmas Eve tradition of christmas PJ's and festive TV Programmes is the best! What a fun post to read! Home Alone is one of my favorite holiday movies! Love this tag. I'm not much of Christmas person, but I can't help but envy your tree. Love reading tags cause they give you a glimpse of the people behind the blog! I, however, am too lazy to answer one haha! Hope to get around doing one soon! Lovely post, girls! <3 Hope the rest of the week is amazing for you both! Wonderful tag! I love your answers! Have an awesome Christmas! I love your tree! White Christmas trees are my favourite. Such a great answer, you girls looks so beautiful! Это потрясающий пост! Я очень люблю зимние праздники и с радостью тоже отвечу на такой TAG у себя в блоге! 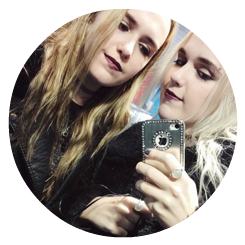 Our names are Leah and Rachel Collins, two 19 year old twin girls from England who love heavy metal music, fashion and beauty. Festive Fashion | Christmas Jumpers! © Beyond the Velvet. All rights reserved.